This is another version of 'Herbal Chicken' which is somewhat like soya sauce chicken except that there are herbs added on to it. Clockwise ~ Chinese red dates, sweet, enhances and harmonizes the effects of other herbs. It helps to invigorate the spleen and stomach, nourishes the blood and calms the mind. Codonopsis root - 'Dong Sum',- commonly referred to as a poor man's ginseng, beneficial to the lung, spleen and stomach. Reduces blood pressure and increases immunity and haemoglobin. Chinese Angelica - 'Dong Quai', rich in iron is commony used in conjunction with other herbs as a remedy for disorders of the menstrual cycle. Also used to purify the blood stream and stimulate circulation. Wolfberries/Goji berries, help reduce fatigue and stress, can improve mental performance. Contain high level of antioxidants, higher than all the other fruits and veggies, second only to dark chocolates. Astragalus root - 'Bei Qi' also benefits the spleen and lung, lowers blood pressure and regulates the blood sugar. After cooking the chicken for about 35 mins. or so, check whether it's completely cooked, then use a strainer to dish out the chicken. I love the smell of the Dong Quai and this chicken is truly delicious especially served with hot white rice. 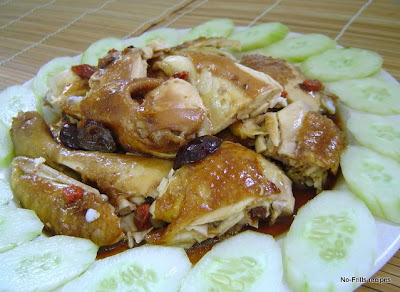 Not a bad idea to whip this up for the coming CNY reunion dinner! Clean and wash the chicken, pat dry and rub with some salt, inside out. Rinse the Chinese herbs and saute in a heated wok with the oil. Add in the water and red dates, salt, sauces and sugar, bring to the boil. Once it's boiling, put in the chicken, lower the heat to medium and bathe the chicken with the sauce. Cover and let simmer for about 20mins. Turn over the chicken to the other side and let it cook for another 15 mins. Add in the wolfberries. Prick the thickest part of the chicken, the thigh, with a fork to test whether the chicken is cooked. If no blood oozes out, the chicken is done. Test for taste. Add in the Shaoxing wine and turn off heat. Dish out the chicken with a strainer, drain and once cooled, chop it up and place on a serving plate. look a bit like black sauce chicken. I was just planning to make this chicken this coming week. I love herbal chicken. I just steam it sometimes, so that I don't need to watch fire. Lazy me...hehehe....looks yummylicious. This reminds me of begger's chicken! Looks so yummy! Yes it does, difference is the herbs. Simple and easy to cook recipes are on my agenda .... lazy! This requires the minimum monitoring. very nicely done..especially the color ..looks so tempting too..not sure about my family but i sure love this! I need to "no" as well! Herbal chicken looks absolutely delicious. Thanks for sharing the recipe. Just had this for dinner. Everyone loved it. Going into my "Favourites"! So glad to know that you and your family enjoyed it. Thanks for visiting my blog!